Got a small patio area? Or maybe you want a grill you can take on the road? Whether you’re short on space or want something truly portable, our buying guide will help you find the best small gas grill for your needs. Let’s jump in! 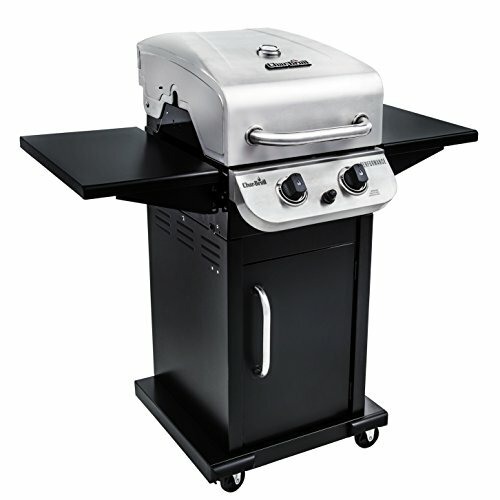 The Weber Spirit II E-210 Outdoor Gas Grill is our top choice. It’s the perfect combination of modern features wrapped up in a compact, beautiful design. Sleek and slim, the Char-Broil Performance 300 is easy to move and hides its propane tank in a cabinet storage space. The Weber Q1000 is a no-frills grill that provides even heat through its cast-iron cooking grates. The Cuisinart Petit Gourmet is the lightest and most portable grill on our list. 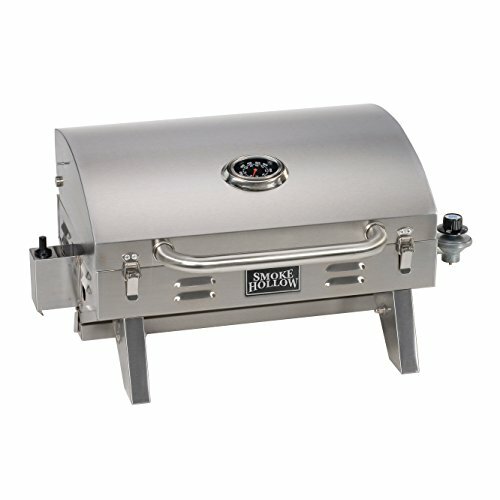 With its beautiful stainless steel exterior, the Smoke Hollow 205 makes a great addition to an outdoor kitchen area – but it’s also great for camping and tailgating. Making the right choice for you and your available space is important. Here are a few things to consider before you select a grill. Before choosing a grill, think about how often you’ll need to move it. The first two recommended grills on our list are designed for small patio areas and aren’t truly portable. However, they still have wheels, and their folding side shelves are useful if you plan to store away your grill between uses. If you’re looking for something highly portable for tailgating or camping, then a lockable lid is a nice feature to have. Be sure to also consider the overall dimensions and “footprint” of each grill. While grills 3-5 on our list are light enough to lift up and take in your car, they aren’t tiny and might take up a little more space than you imagine. The grills on this page run on gas – that goes without saying. Specifically, most grills are built to use liquid propane, which is available in 20-pound tanks from hardware stores and supermarkets. Additionally, you can find smaller, disposable tanks from camping equipment stores. However, if you have access to natural gas at your location, consider it as a fuel source for your grill. And if it’s something you’re interested in, make sure the grill you choose has the necessary attachments and hook-ups. When space is limited, it is wise to maximize what you have, and some compact grills come with a built-in storage area for that purpose. Consider choosing a grill with some storage for your barbecuing tools and the propane tank. For example, the second grill on our list (Char-Broil Performance 300) has a cabinet area that both provides storage space and conceals the propane tank. There are hundreds of smaller gas grills on the market, but not every grill is built to the same standard. Choose a grill made from high-quality materials, like stainless steel and cast iron, to be sure that it will be usable for many years with the proper maintenance. A thicker metal will help with heat retention and aid in preventing warping due to weather extremes if the grill is left outside. Let’s take a look at some of the top small gas grills available, starting with our #1 choice. Compact, stylish, and powerful, the Weber Spirit II E-210 is our top pick. Available in a variety of colors, this grill is not only an attractive addition to your outdoor space but also packs a grilling punch. While it weighs 100 pounds, it has two large wheels that make it easy to move. 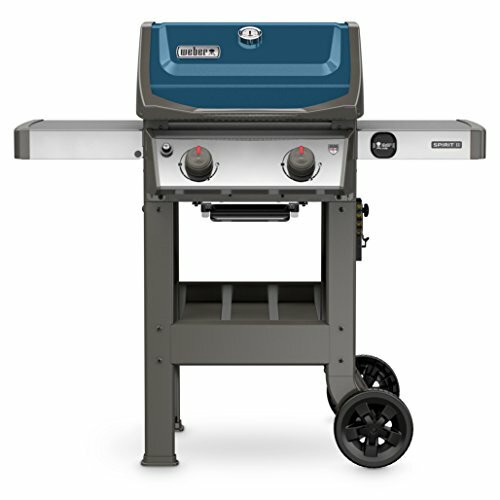 Weber refers to some of this grill’s modern features as the ‘GS4 Grilling System’. These features include: 1) Infinity Ignition, which is guaranteed by Weber to ignite every time, 2) Burner Tubes, which allow for consistent gas flow and even cooking, 3) Flavorizer Bars, which create a smoky flavor from food drippings, and 4) Grease Management System, which ensures that excess drippings are funneled into the convenient drip tray. With its open cart design, the Weber Spirit provides space to store your grilling accessories. It also provides hooks for hanging tools and utensils. The left side table folds down, which is useful for storage. The porcelain-enameled grate provides 450 square inches of cooking area. Lastly, this grill features both a fuel gauge for liquid propane tanks and attachments for natural gas hookups. Sleek and slim-line, the Char-Broil Performance 300 grill provides ample cooking space with a surprisingly narrow profile. The liquid propane tank is stored in a closed cabinet beneath the cooking area. This keeps the tank both hidden and safely stored if you are keeping your grill outside. Additionally, the cabinet provides storage space for accessories like grill brushes and utensils. With 300 square inches of grilling area, this model provides ample cooking space. And that doesn’t even include an additional 100 square inches with a swing-away warming rack. This rack is perfect for warming sides or toasting buns. The grills and two burners are crafted from cast iron and stainless steel for durability and to ensure even cooking and heat distribution. You can also take advantage of increased prep space with two folding shelves on either side of the grill area. Aiming to make grilling easy as possible, this Char-Broil model has a built-in temperature gauge mounted on the lid. That means a thermometer isn’t necessary, but I would still recommend one for measuring meat doneness. Clean up is simple with the addition of a removable grease tray, coated with porcelain to prevent sticking and build-up. To ensure mobility, this grill weighs in at 82.5 pounds and is equipped with four wheels. Additionally, two of the wheels have a locking feature for security while in use. If you are looking for something truly compact and effortlessly portable, the Weber Q1000 grill might be right for you. Weighing in at roughly 27 pounds, it is fairly light and easily moveable considering its power. It provides 8,500-BTU (British Thermal Units) per hour, heating the 189 square inches of cooking space easily and evenly. Crafted from heavy-duty materials, like porcelain-coated cast iron for the cooking grates and a cast aluminum body and lid, this grill is designed for durability and to withstand being moved frequently. Large, ergonomic side handles, control knob, and grip handle for the grill lid make moving and cooking with this Weber grill very simple. The one-touch push ignition provides reliable results every time. Note that while cast iron grates take longer to pre-heat, they provide a more consistent, evenly heated cooking area. Adaptable in nature, this grill model can run on both disposable liquid propane tanks as well as the standard 20 lb. tanks. A separate hook-up accessory is available for purchase should you want to fit a larger propane tank. Lastly, with its split grate design, one grill grate can be removed and swapped for a griddle plate. That means pancakes are no problem! 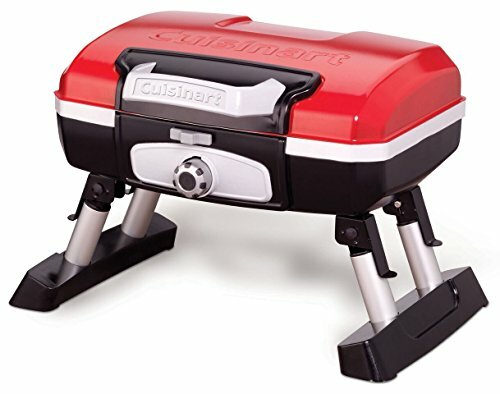 Not only is this small-in-stature grill the ideal companion for outings, camping, or just grilling in your backyard, this stylish Cuisinart grill is available in a variety of colors to suit your personal tastes. Weighing less than 20 pounds, this is the lightest and most portable option on our list. With 145 square inches of grilling space, this Cuisinart grill is the smallest on this page. However, it packs an impressive 5,500 BTU output. With the inclusion of the porcelain-enameled grate, heat distributes evenly for consistent cooking. One advantage of the small size is that this grill heats up the quickest. And when you’re finished cooking, the grill is super easy to clean. It features a removable grate that’s dishwasher safe in addition to a handy drip tray. Making it even more compact, this grill has folding aluminum legs. They lock into place when in use and tuck neatly away when being stored or transported. The oversized carry handle makes maneuvering easy, especially since the grill lid also has a locking mechanism to prevent opening. Fueled primarily by disposable liquid propane tanks, which can vary in size, this grill can also be adapted to use a 20-pound tank, providing a suitable hose is also purchased. Small but mighty, the Smoke Hollow 205 tabletop grill has an incredible 10,000 BTU burner, which is the most powerful compact-sized grill on our list. Though it uses portable, disposable liquid propane tanks, it can be adapted with a hose to use the larger, more commercially available 20 lb tanks should you decide to leave it in one place. With 205 square inches of grill space, this model offers a large cooking area considering its relatively small size. Also included is a 100 square inch, chrome-plated warming rack, perfect for cooking sides, toasting buns, and grilling vegetables. Made from stainless steel, the entire grill is designed for durability and to withstand not only environmental stressors but also all that comes with being transported regularly. 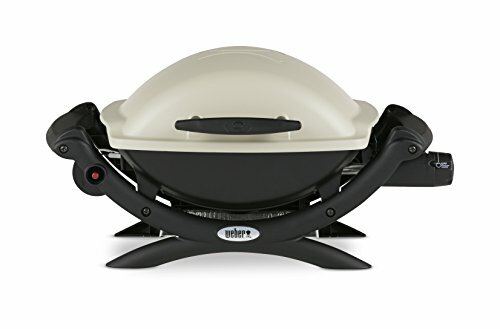 To aid with mobility, the legs of this model fold away, the lid locks closed with two reinforced latches, and a large carry handle is placed conveniently at the front of the grill lid. Cleanup is made easier with the addition of a removable drip tray, which slides from the bottom of the grill after use. Push-button ignition enables a reliable start every time, and temperature can be accurately maintained and monitored with the inclusion of a gauge built into the lid. The Weber Spirit II E-210 is our #1 best small gas grill due to its quality materials, modest size, high-tech features, and ample mobility – it’s also one of the best looking grills on the market. However, you should remember that we think highly of all the grills included in this list. It’s really about finding the best fit for your life, and hopefully we’ve helped you do that. If you have any experience with or thoughts about our top grill picks, please let us know in the comments below!